It takes me awhile to get to this next blog as the senseless death of Oscar Bartholomew settles in my head along with the many perceptions, attitudes, opinions that gather in the streets like carnival out of sorts with its own costumes and masks. 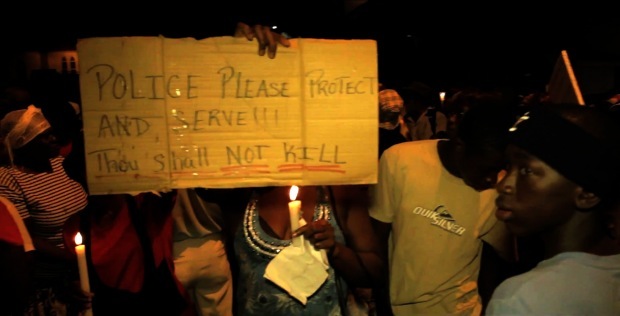 Grenada made headline news internationally, nationally and regionally the last week of 2011 after a Grenadian, Toronto resident, Oscar Bartholomew was beaten to death while in custody at the St. David’s, Grenada police station. Five police officers were charged with manslaughter. This unfortunate and violent incident has led to a community and national outcry for justice. I watch my own opinions, reactions, and questions rest heavily in my head and then I open my heart to what is being said in the streets, on the block, on buses and in community. I take note and watch how this highly charged incident spins into many different directions. The next night another Minister is on the news to tell Grenadian people that Grenada is still one of the most peaceful places in the region, in the world and I can’t help think…. for who? I do agree with him that Grenada is a safe country for tourists and in particular those who have fair skin or those who speak the Queen’s English or those in high economic standing; safe for those of us from European descent who decide to make Grenada our home. Therefor it is a shame that this incident may affect the tourist industry due to media not presenting the whole story. However is Grenada safe for her own people? Is Grenada safe for those who make unhealthy choices due to hard economic times, or a life of strife with physical and emotional abuse; Is Grenada safe for young women who fall prey to older men? Is Grenada safe for kids in school who may have learning disabilities or emotional disabilities but are mistaken for bad behaviour? Is Grenada safe for young boys who have absentee fathers and cry out through violence for some sort of attention? Is Grenada safe for young girls being sexually assaulted by their daddies, their uncles, their cousins? I could be speaking about any country when it comes to peace and safety and what this means in the context of some and not others. For example I have grown up my whole life being told Canada is one of the most peaceful countries in the world. However now i ask, peaceful for whom? Is Canada peaceful for First Nation people who have spent lifetimes fighting a system that discriminates and excludes, a system that denies and buries a brutal violent past that denied and denies First Nation people their human rights; is Canada peaceful for those who decide to speak out against globalization at G8 summits; is Canada peaceful for inner city or rural youths who are discriminated against because of the colour of their skin, their sexual orientation or the state of their economics? Is Canada peaceful for girls, women coming from different cultures, economics, countries who are abused daily behind closed doors? When five policemen beat to death one of their own, what state of peace do these men hold within themselves? Where does peace begin? When will we begin to understand peace on an individual, family, community, and then national, global, level? How can we reclaim the word peace from its broad and generalized definitions? Just because Canada and Grenada are not war torn countries are we able to say with confidence that Canada and Grenada are peaceful countries and for who? Thank you Oscar Bartholomew for enabling me to write this blog, enabling many of us to think more critically on what peace means and for whom it means. Thank you Oscar Bartholomew for sacrificing your life so that other Grenadians may not have to suffer what you suffered. Thank you Oscar Bartholomew for creating a more critical breeding ground for these questions to rise, simmer and hopefully be resolved. Thank you for giving birth to a new sense of power, ‘power with’, as people marched in the streets in unity and spoke against your death and finally thank you Oscar Bartholomew for being that spokesperson even without a voice! In october 2011 the participants and facilitators of the Community Conflict Transformation and Peace Building ceritifcate course at the Coady International Institute were honoured and priveleged to welcome Dr. Lawrence Carter, mentee and friend of Dr. Martin Luther King, Jr. Dr. Carter honoured us with his gentle, humble, powerful presence and shared 64 ways in 64 days as a means of inspiring us to be bigger then we already are. In Dr. Lawrence's words "We need to find the Martin Luther King, Jr. inside ourselves and develop and share with the rest of the world." In honour of Martin Luther King, Jr. Day I share with you 64 ways in 64 days. I choose to reflect on what peace means to me. I choose to work to understand and respect another culture. I choose not to take myself so seriously. I choose to take some time to admire and appreciate nature. I choose to plant seeds - of plants or constructive ideas. I choose to be aware of the hungry and how I may help them. I choose to acknowledge every human being's fundamental right to justice, equity, and equality. I choose to appreciate the earth's bounty and all of those who work to make my food available (i.e., grower, trucker, grocery clerk, cook, waitress). I choose to walk rather than drive to nearby destinations. I choose to oppose injustice, not people. I choose to call one of my elected officials and voice my opinion. I choose to be aware of what I say and refuse to gossip. I choose to live in the present moment and release the past. I choose to silently acknowledge all the peacemakers throughout the world. I choose to speak with respect to every one I talk to. I choose to tell someone I love them. I choose to speak honestly from the heart. I choose to cause a ripple effect of good by an act of kindness toward another. I choose to use my talents to serve others. I choose to treat people who work in the service industry with respect. I choose to say "No" to violent movies, TV, and videos. I choose to express appreciation and gratitude to at least two people a day. I choose to greet others with a smile. I choose to drive with tolerance and patience. I choose to relieve my frustration by taking a walk or in some other healthy way. I choose to take time to listen carefully to another's point of view. I choose to talk less and listen more. I choose to notice the peacefulness in the world around me. I choose to recognize that my actions directly affect others. I choose to take time to tell a family member or friend how much they mean to me. I choose to acknowledge and thank some one for acting kindly. I choose to send a supportive, anonymous message to someone. I choose to identify something of value in everyone I meet. I choose to treat animals with care and consideration. I choose to practice praise rather than criticism. I choose to strive to learn from my mistakes. I choose to recycle grocery bags or use cloth bags. I choose to hold children tenderly in thought and/or action. I choose to listen without defending and speak without judgment. I choose to help someone who needs support. I choose to listen with an open heart to at least one person. I choose to treat the elderly I encounter with respect and dignity. serve as a model to them. I choose to treat my co-workers with understanding and compassion. I choose to recycle more of my trash. I choose to appreciate the gift animals bring to our world. I choose to work to help others resolve differences. I choose to express my feelings honestly and nonviolently with respect for others and myself. I choose to share a meal with another. I choose to write a letter to one of my representatives in Congress saying I want the U.S. to be a world peace leader. I choose not to use violent language. I choose to pause for reflection on how I am living my values. I choose to seriously consider letting go of a grudge. I choose to carpool more often. I choose to acknowledge to another or myself something I regret. I choose to reflect on whom I would like to reconnect with. I choose to love myself as I am. I choose to enlarge my capacity to embrace differences and appreciate the value of every human being. I choose to smile at a stranger. I choose to support peace by educating myself. I choose to write a letter to the editor about something I'm thankful for in my community. I choose to pause and think before I say something hurtful to another. I choose to give a hug to someone I care about. I choose to reflect on what peace means to me now. Adapted from 64 Ways in 64 Days from A Season for Nonviolence created by The Association of Global New Thought, http://www.agnt.org/. With strength and mindfulness Maya and I cross over and land firmly on Grenada soil; soil that supports, embraces and enriches our arrival. But not before saying goodbye and giving thanks and praise to the past six months on Canadian soil spreading its roots and anchoring us to friends and family. Our last couple weeks before crossing over were spent saying goodbye at small and large gatherings; from dinners at the Farm to sharing gifts of love and gratitude with our room-mates Alex and Riley, to farewell socials and banquets with Coady community, to journeying by train and embracing mom and dad before taking the leap into our next home. While in transition we were met with usual stares of confusion and delight. I laugh and make note of the stares which in my view are about the uniqueness of cinnamon and peach mama and daughter with their dreadlocked hair. The usual looks of delight and confusion; fear and judgement. A young black youth man smiles brightly, fist in the air “Rasta” he cries whole pushing an elderly women to her gate. A young wide eyed five year old staring up at Maya and I’s hair is pulled impatiently by her mom and told not to stare. We touch down in Grenada after curling up on Trinidad’s airport benches for the night, breathing in the Caribbean air knowing we are home even in the waiting. Grenada Immigration Officer, “Why you standing in the Visitor’s line man? You are Home!” We are Home moving into our unique, colourful larger then large lives! Because I can’t believe you are ten years old. Because I can’t believe ten years ago village friends were dropping by and you were in my arms, an hour old, suckling and squirming while friends expressed their surprise and shock at their white ras neighbour who they never thought would give birth to her baby at home, in the village! “ahh how Maureen brave so! She real brave oui?” And me proud warrior Mama smiling at this soon to be 10 year old daughter folded into the softness of my arms. Ten years I repeat like a mantra gone mad. Like a mantra dedicated to disbelief and wonder. Like a prayer cradling this glorious Grenadian, Canadian, multi racial, spiritual, cultural, miracle child who blesses us with her quiet, gentle, strong wisdom day by day!